This giveaway is now CLOSED. Thanks so much to our wonderful sponsor Wanchai Ferry and MyBlogSpark! We look forward to working with you again! The winner has been notified and upon confirmation, follower name will be posted both here and on our homepage. Remember: There are great giveaways active on the upper right hand side of the page! Summer in a New York City apartment gets sweltering to put it mildly and when the heat is on, and I go from work straight to evening events, the last thing I want to do when I finally get back home is cook, especially when the apartment is already as hot as an oven! I try to avoid fast food as my first option all the time for many reasons, and as a result like to have a variety of fast, easy to prepare offerings at the ready. Not to mention sometimes I arrive back so late that the fast food options are closed already, what do you do when you get home from an event, it's after midnight and your favorite Chinese Take Out is already closed and you really want Chinese Food for dinner? That's where Wanchai Ferry comes in. I remembered recently after coming home from a late night event that offered 'light' apps and water that I had some Beef and Broccoli in the Fridge, Wanchai Ferry to the rescue! 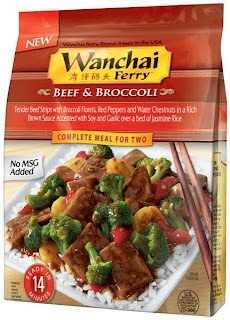 The newest Wanchai Ferry flavor, Beef & Broccoli, is the first beef dish in their line of great-tasting, complete Chinese meals for two. Ready to serve in only 14 minutes, Wanchai Ferry Beef & Broccoli comes with tender beef strips, and an assortment of Asian-style vegetables, including broccoli florets, red peppers and water chestnuts. It even includes rice and a rich brown sauce accented with soy and garlic for an authentic flavor experience. I was pleasantly surprised after I prepared it that the brocolli cooked up just right, not overly firm, not soft or mushy and the water chestnuts had a fresh burst of flavor and just the right snap (not even my favorite take out place always gets the brocolli right!). Grab a $1.60 off coupon and try a Wanchai meal yourself this week. The website even has tips to dress up your meal and make it more special. Ƹ̵̡Ӝ̵̨̄Ʒ - WIN IT! 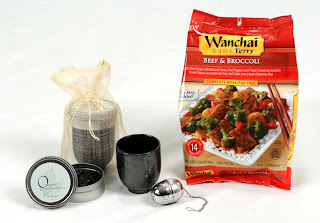 - Thanks to Wanchai Ferry and MyBlogSpark the winner of this giveaway will receive a VIP product coupon for a Wanchai Frozen dinner of their choice, as well as, 2 tea sets. Don't you just ♥ Wanchai Ferry? I know I do! How to Win: (1) You must be a PUBLIC follower of Ascending Butterfly to be eligible for this and all giveaways. Indicate in your entry that you follow (if your 'comment name/user id' differs from your profile id, please let me know what name you follow under) and (2) Mandatory Entry (this must be done for all others to count): Tell me which one of the dinners you would get with your VIP coupon. (3) You must also leave your email address somewhere in your comment. (You can format it this way for security, example: ascendingbutterfly AT mail host DOT com). (If your email is clearly visible in your profile, you can just say so, that's OK!) Please follow the easy 1, 2, 3 steps to winning (or in this case, the A,B,C’s of winning!) This giveaway is open to USA residents who are 18 years of age or older. FTC Disclosure Info for this Giveaway: This is not a paid insertion. This is a non-compensated post and all opinions regarding the products are expressly my own experiences. I was provided product to facilitate my review and for the giveaway. The sponsor is fulfilling directly to prize winner(s), this in no way influenced my opinion of the product. a product sample was provided to me by Wanchai Ferry, through the MyBlogSpark program, and once a winner is selected and their information has been forwarded to the sponsor, the responsibility of prize fulfillment rests with the sponsor. I'd like to win a coupon for this! I follow on Google...meredithfl at gmail dot com. I'd get the Szechuan Chicken! I'd like to try the sweet and spicy shrimp. Thanks for the chance. 2.) I would love to try the Orange Chicken, it sounds delicious! Id love to try the beef and brocolli. I'd get the sweet & sour chicken . I would like to try the orange chicken and I follow you on google friend. I would like to try the Beef and Broccoli. I am a public follower via GFC. I follow on Twitter @krstrpp (krstrpp at hotmail dot com). I follow you on GFC(5webs) and I would choose the spicy garlic chicken . I'm now publicly following with GFC, I'd love to try the Sweet & Sour Chicken or the Garlic Chicken! mm I want to try the orange chicken! Following on this account, I use gmail with username oritape. I'm a new follower, I would use my VIP coupon on the Beef and Broccoli dinner. I'm a public GFC follower and I want to get Orange Chicken. GFC follower. I would love to try the beef and broccoli variety. I'd get the Kung Pao Chicken ! I would get the Orange Chicken. I would like to try the Kung Pao Chicken! Follower and shrimp lo mein for me! I'd get the Beef and Broccoli. I'm following! I would choose Kung Pao Chicken. I would choose the Kung Pao Chicken. Sweet and Sour Chicken... yummy! I'll go with spicy garlic chicken, 'cuz I like spicy and I like garlic...and I like chicken.